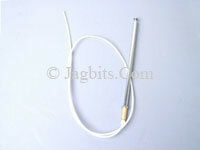 The 1986 and later XJS, and the 1988 and later XJ6 have a replaceable antenna mast and drive cable assembly, so if the aerial is broken off or malfunctions, it's a relatively inexpensive fix (prior to this, you had to buy a whole antenna unit for a couple of hundred dollars. The antenna mast goes up and down by the use of a plastic drive cable. The "teeth"on the drive cable engage with the antenna motor, which allows the motor to move the mast up and down. When your mast gets sticky or otherwise uncooperative, it's a sign that the mast and drive cable assembly needs replacing. When you replace this assembly, be sure to also replace the rubber antenna grommet that seals the mast against the fender. These get hard and crack, allowing water to leak into the trunk area. We sell the antenna mast on the website under part number DBC2200 which fits XJ6 models from 1988-1993 and XJS models from 1986-1993 TO VIN 190527 and part number LNA4134AA which fits 1994-1997 models, 1994-1996 XJS models, and all XJ8 and XK8 models also.